LOUDOUN CO., VA – Rolling hills, vast mountain range views, magnificent wooded acreage and of course uncrowded living have attracted families to Loudoun County – especially the western regions – for years. That’s why CarrHomes’ new Loudoun County communities, in Hamilton and Purcellville both offer a minimum of one-acre wooded homesites. Most are two-three acres. More than just acreage though, you’ll find our award-winning two and three-car garage homes with up to 6600 square feet of interior space feature exquisite detailing, custom-quality finishes and expansion possibilities focused on where and how your family spends the most time: bright rear morning rooms and side conservatories, extra bedrooms and baths, larger family rooms, media centers and exercise rooms. 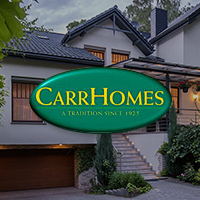 And only CarrHomes includes our built-in 22 signature differences, standard. To us it’s simple. Acreage is only as great as the home that sits on it.